Lip fillers are the most requested treatment at our Sydney clinic. Beautiful lips are important for enhancing the appearance of the face. Patients with small or poorly shaped or proportioned lips can be helped by the artistic placement of lip fillers. Some people were born with great lips, and others were born with lips whose appearance could be improved. For those who weren’t born with the perfect lips, there are many ways we can change lips to improve their appearance. Often patients present with small lips to be enlarged. Often patients have an upper lip which is much smaller than the lower. The “golden ratio” for lips is considered 1:1.618, so the upper should be smaller than the lower, but often the ratio will not be close to this. Dermal filler can change this ratio. Some patients are blessed with a beautiful lip border, and some need dermal filler love! also as we age, the lip border loses definition and gets wrinkly. 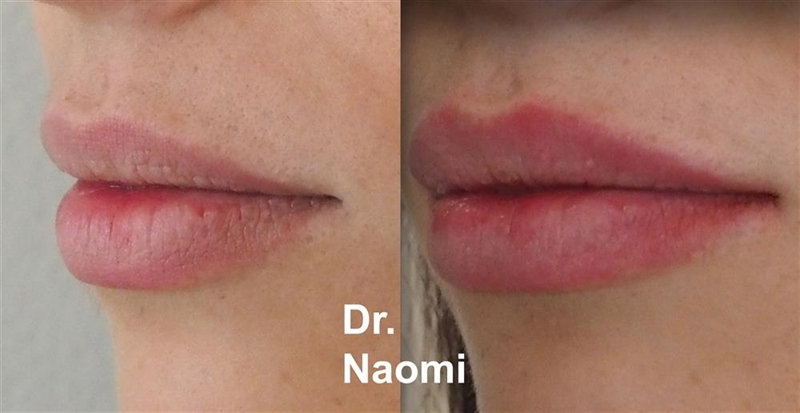 Dermal filler can really make a lip border appear younger and more attractive. When examining the lips, the profile must be checked, and it should be determined if the projection of the upper or lower lips could be improved. Could the philtrum ridges be improved. The doctor will assess the face and decide on the best dose after taking a history and examining the patient. 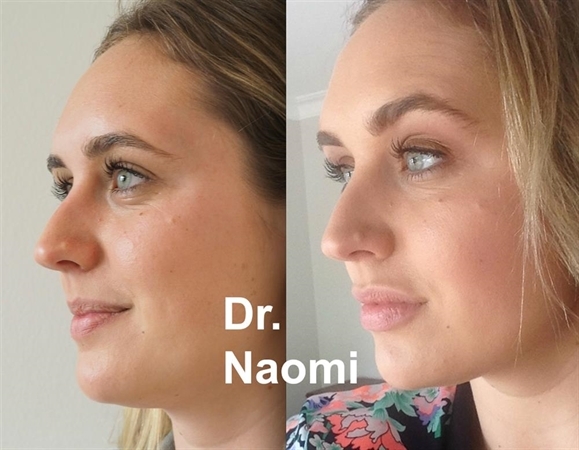 If a patient has a history of complications with dermal fillers, or if their budget is small or if they want a more subtle result, then a smaller dose might be chosen. With lips, a typical way to plan lip improvement is to inject them 1ml at a time and then inject them every month until they reach the size where the patient is satisfied. The face will be cleaned with alcohol. A dental block may be injected into the gums prior to treatment. Ice will be applied to the area briefly before treatment The doctor will inject using a very fine needle. Then pressure with gauze will be applied. If a cannula is used, a small injection of local anaesthetic is injected into the skin and then a fine needle makes a small hole in the skin where the cannula is inserted. The treatment is very low risk. Bruising occurs in a significant number of cases. Swelling in the injection area will occur. This will laser for 48 hours Asymmetry: Sometimes one side is better treated than the other, this is usually because the patient is asymmetrical to start with. Infection is a very rare complication, but always a possibility when the needle goes into the skin. Necrosis (blood vessel being blocked, interfering with blood supply to the skin) is very rare. This could lead to scarring Need for further treatment: Often with lips, it will take several syringes of product to get to where the patient wants to be. Cost is per syringe. 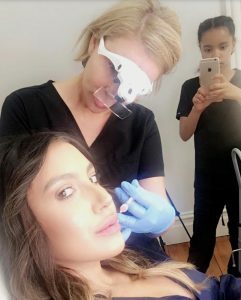 Typically for one treatment, the cost will be from $650-$800 for a lip treatment, depending on doctor and product used. The effect of the lip fillers will be obvious immediately. Most of the swelling from the lip fillers will have resolved by 2-3 days after the procedure. There may be a small amount of swelling for even 2-4 weeks after the procedure. If you notice asymmetry at some time before the 4 week point after lip fillers, there is generally no need to call the doctor. Sometimes asymmetry will occur because one side is more swollen or bruised. Usually it will right itself by the time of the review appointment at 4 weeks. If it doesn’t, then it can be examined at the review appointment. There is no point in coming in early for treatment of asymmetry as there is often swelling associated and so the final result cannot be seen until at least 4 weeks. Treating asymmetry too early could lead to further asymmetry. Cannula may be used for lip fillers,with the purpose of potentially reducing the risk of occlusions, or to reduce the risk of bruising and swelling. Before and after: Lip augmentation and other injectables can make such a difference to a face.